Planning to attend a race at the Pocono Raceway or other outdoor sporting events this summer? Keep these tips from our specialists at Lehigh Valley Health Network in mind to help you stay healthy and make the most of the sunshine season. Slather on sunscreen. Protect your skin from the sun’s damaging ultraviolet (UV) rays by choosing a broad spectrum (UVA and UVB rays) sunscreen with an SPF of 30 or higher. Apply liberally – even if it’s a cloudy or cooler day. Rub sunscreen on all exposed areas of skin, including easily overlooked areas, such as the rims of the ears, your lips, back of your neck , your hairline, tops of hands and tops of the feet. Remember to reapply every two hours. Scope out sunglasses. Shades aren’t just a fashion statement – they help protect the health of your eyes. Overexposure to UV rays can damage the surface of your eyes in the same way you can get sunburned. Choose sunglasses with labels stating they provide 99 or 100 percent UV protection. Dress for the occasion. As you decide what to wear, focus on items that are loose, breathable and light in weight and color. Ladies, looking to spice up your wardrobe? Add a wide-brimmed hat for a fun style and sun protection! Eat light. The best foods for stifling summer days are cool, light and easy on the stomach. A hot, heavy meal will just make you feel warmer, so try to avoid those fried food stands. Need a quick snack? Chilled fruit and crisp salads are good options. Guzzle more water. Drink up! Your body needs extra fluids in hot weather. Get lots of water throughout the day, regardless of your activity level. Drink continuously, not just when you feel thirsty. And as tempting as they may be, try to avoid overdoing it with alcohol and sugar-laden drinks – they can actually be dehydrating. If you or a family member experience a health problem or minor injury this summer, visit one of our ExpressCARE locations to receive expert treatment without an appointment. 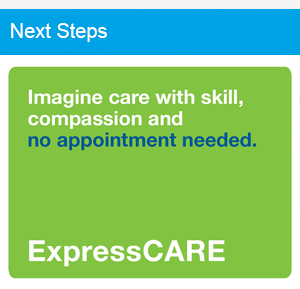 Learn more and find the ExpressCARE closest to you by visiting LVHN.org/expresscare.